Is this a portrait of Lord Cardigan as St George? St George slaying the (Russian) dragon. A portrait of Lord Cardigan? I would have posted this yesterday but had a technical hitch. 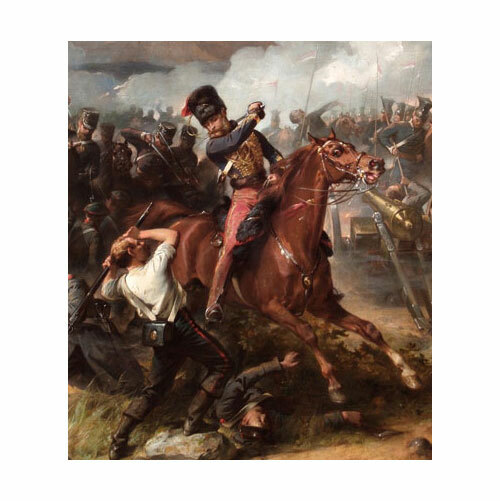 Quite a number of Light Brigade orphans were sent here, including the daughters of William Bassett, 11th Hussars, Joseph Moore, 13th Light Dragoons Thomas Soames, 13th Light Dragoons, Richard Dollard, 17th Lancers, and George Flowers, 17th Lancers. The architect was Major Rhode Hawkins, working in an overtly medievalist style. The foundation stone was laid by Queen Victoria on 11th July 1857 and the first phase was completed in 1858. The result was judged to be ‘bold, picturesque and effective’ by The Building News (8 October 1858). The first inmates were received on 1 July 1859. An early “artist’s impression” of the building when work began in 1857 features not a sculpture but a clock. I haven’t been able to find out when or why the decision was made to substitute St George, or indeed who made the sculpture, but it was a striking choice. 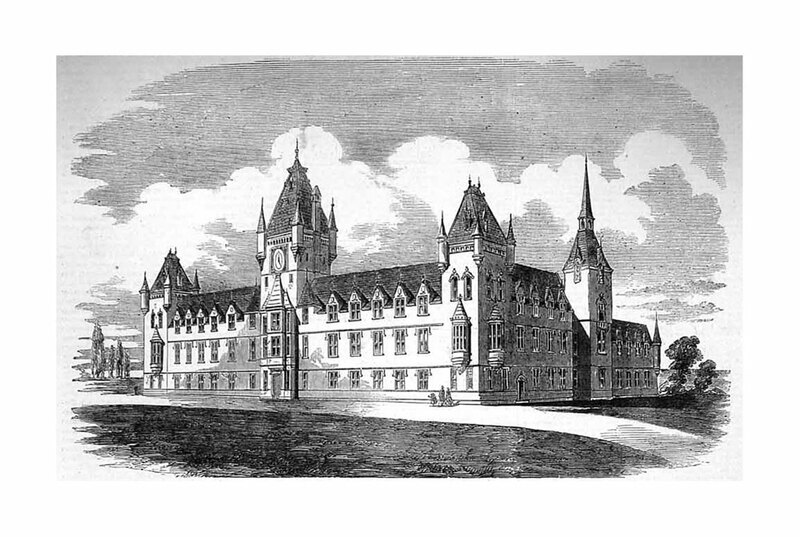 Artist’s impression of the Royal Victoria Patriotic Asylum for Girls, showing a clock on the central tower. Illustrated London News, 15 July 1857. Royal Victoria Patriotic Asylum for Girls, now the Royal Victoria Patriotic Building. Notice St George high on the central tower. 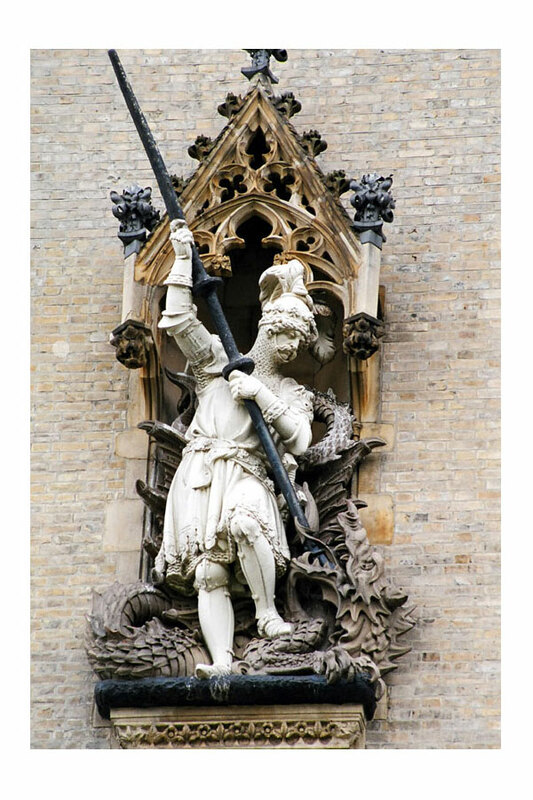 St George was an obvious choice of image for this “Patriotic” asylum for girls whose fathers had only recently died in the Crimean War – after all, as England’s patron soldier-saint, his martial and chivalric virtues in defence of a maiden in distress were well-known. There is a long and deep royal connection (St George’s Chapel, Windsor; the Order of the Garter. And George also has multiple associations with the “East”: with his homeland, Turkey; with the Crusades to recapture Jerusalem; and possible even with the defeat of Russia, that dragon from the East. 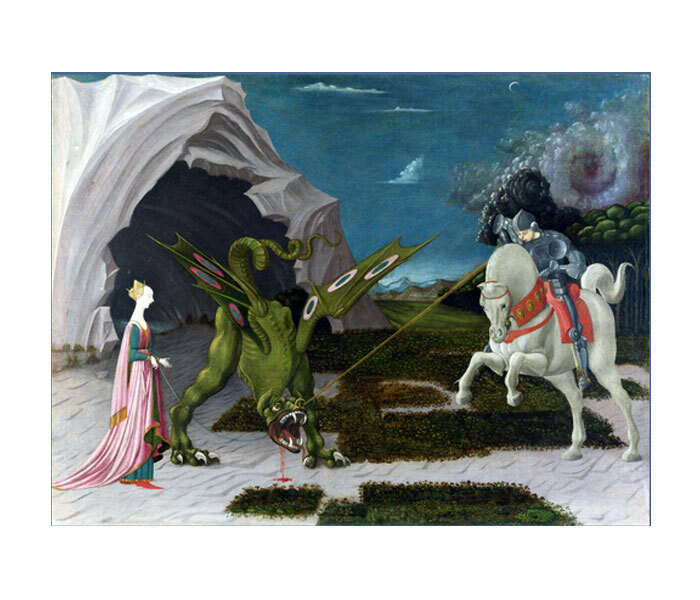 St George saving a maiden in distress. Paulo Uccello, about 1470. National Gallery, London. Cardigan “Taking the Russian Guns” (detail), Thomas Jones Barker, first exhibited 1877. Army Staff College, Camberley. Life for the orphans was extremely harsh. Their work included pumping water by hand from an underground rainwater system in the rear courtyard up to the lead-lined slate water tanks in the towers. They had to launder all the clothes. Their heads were shaved to discourage head lice and they were made to assemble in the courtyards every morning to be hosed down with cold water. The patented warm air heating system failed to work. Fireplaces were added to the staff rooms but no heating was provided to the dormitories. But is St George modelled on Cardigan? George is almost always portrayed young and clean-shaven, yet this St George is a mature, rather fatherly older man. Moreover, explicit references were indeed made just after the Charge to Cardigan as the inheritor of Richard I’s “lion heart”. (It was Richard who brought St George and his red cross back to Britain.) And of course it’s the trademark moustache that’s surely most suggestive. But if is indeed Cardigan, shouldn’t St George be on horseback? This is indeed a little odd as almost all previous images (and there many) depict George mounted. But of course the Asylum would be taking girls not only from all regiments of the army, not just the cavalry, and also from the navy and marines. Surely depicting St George on horseback would have been both too obvious and too potentially divisive? (Besides, the erect St George fits the space better.) Anyway, many subsequent depictions of St George on war memorials (and there are any) after the First World War show him standing erect. An even more persuasive objection is that Cardigan should have been the last to be chosen as a “father figure” to the girls. 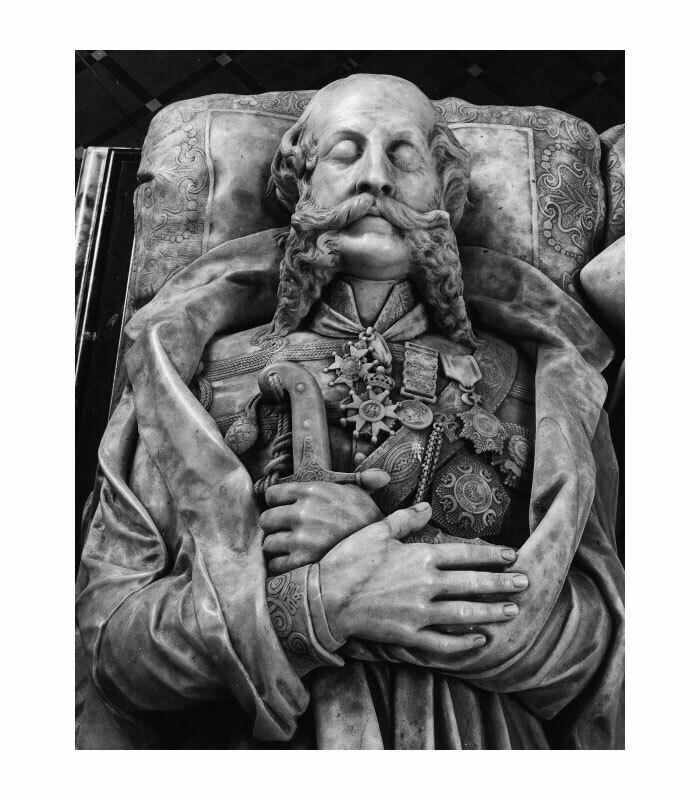 He himself had no legitimate children (hence his famous line when embarking on the Charge, “Here goes the last of the Brudenells”), only (according to his biographer John Sweetman writing in the DNB) a number of illegitimate ones. 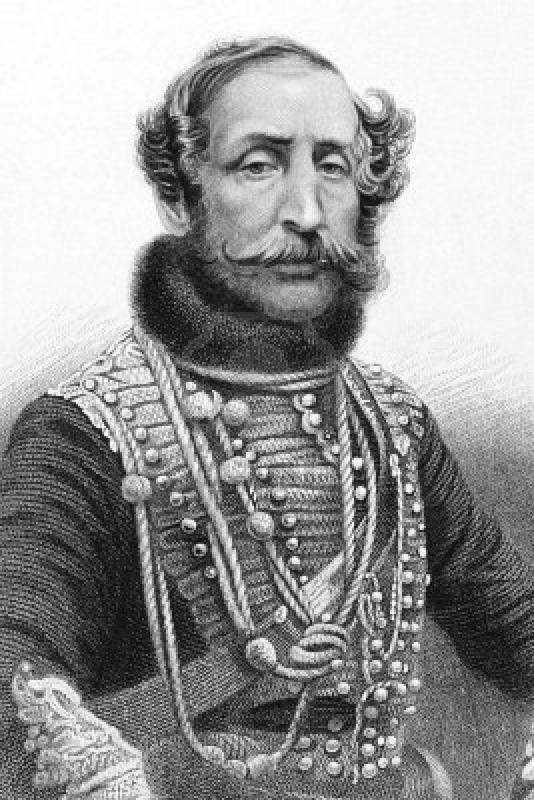 Undoubtedly brave in battle, he was, as Anglesey put it it, also “an insufferable cad… he behaved towards women like an insensitive, overbearing, over-rich, spoilt child.’ [A History of the British Cavalry, vol.2, p.109]. So not such a good “father figure”, then. Even at the age of 65, having fallen badly while hunting and thereafter suffering seizures, his “taste for flirtation hardly diminished…he seduced Sir William Leeson’s young wife, and in 1857 took as his mistress Adeline De Horsey” [Sweetman, DNB]. Cardigan was 60 and the glamorous Adeline Horsey de Horsey (you couldn’t make it up) was twenty-seven years his junior. But his reputation in 1857, while the building was going up, was still relatively intact. 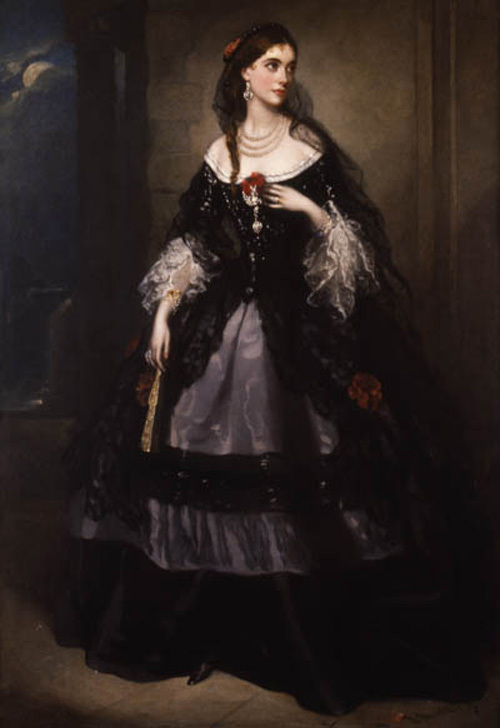 The Countess of Cardigan, formerly Adeline Horsey de Horsey. 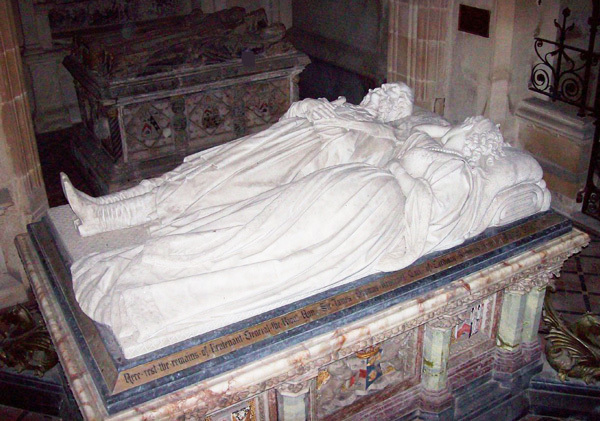 Interestingly the couple themselves had a pronounced taste for medievalist sculpture – see their bizarre tomb at Deene Church (I have posted more images here). I have yet to visit, but it would be good to know if there are any explicit references to St George.